Founded in 2008,Fit for Life Fitness is a private practice of high-end In-Home Personal Trainers, Health Coaches and Nutrition Specialists. We make house calls to many of Washington DC’s top professionals and their families.? Our clients experience training in the convenience and privately of your own home or business. Daniel is a personal trainer but also inspire and motivate people to lives at the full potential and become the best version of themselves. He leads a team of in-home personal trainers in the Washington, D.C., area. Daniel and his team of experts design fitness and nutrition programs for clients around the world. He has trained hundreds of elite and professional athletes, including Argentina tops soccer,tennis,basketball players as well elite athletes. Washington DC Metro top professionals and their families trust to Daniel because he produces results that last a lifetime without sacrificing quality of life. We help our clients to live a healthier lifestyle. Our comprehensive fitness, nutrition, and lifestyle change program have been endorsed by multiple physicians. Daniel has been featured in IDEA Health and Fitness Magazine as Top Fitness Professional in Washington DC and magazine contributor for IDEA Health and Fitness Associatio. Daniel is a certified trainer in ACE,COMBINE 360,TRX,Performance Coach and Sports,Nutrition Coach with Precision Nutrition and Functional Aging Specialist with FAI. 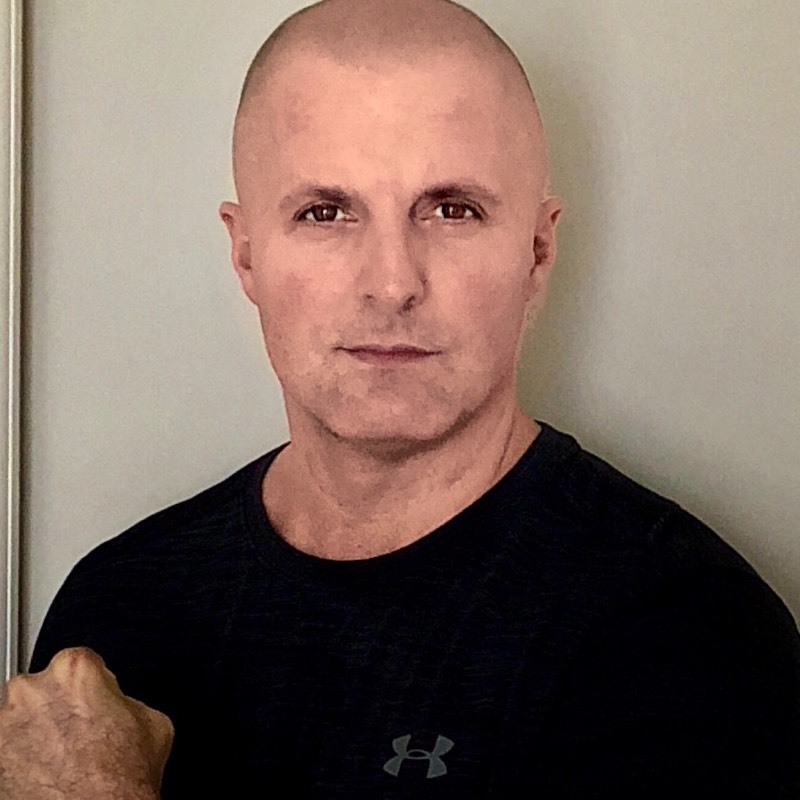 Daniel was named Argentina’s most successful personal trainer, and worked in Washington DC Metro area as a Specialist Trainer until 2008 when he opened Fit for Life Fitness In-Home Personal Training Specialists. I have been using Daniel as a personal trainer since June 2007. We have met twice a week since then to work on my fitness and strength goals. I am presently over 60 and ski avidly; my skiing was the primary reason for working with Daniel in order to gain strength to prevent injuries. Our workouts have been fantastic and I can recommend Daniel to anyone who is serious about getting themselves into condition. I have found through these years that Daniel has a sense of what can and cannot work. He has been a faithful and patient trainer who has helped me become more physically fit. If you are looking for someone to work with you then you will be pleased with Daniel. I have been working out with Daniel twice a week for 21 months. I really enjoy our sessions which are a combination of TRX, Rip Trainer and running. Daniel is very good about adapting our workout to my personal needs and strengths. He also changes the workout to keep it challenging. Whenever I feel like I'm comfortable with either the number of repetitions or speed of sprints, Daniel will increase or change the workout to increase my strength and endurance. He is an awesome trainer and I recommend him to all my friends. Best of all, I can fit into my jeans again. I am a 65 year old with MS. I have worked with Daniel twice a week for more then three years now. To me he is a great advantage. He takes time to explain each muscle group and it’s benefits. He varies our routine so workouts never get stall or old. I hope to be working with Daniel well into the future. I am a woman in my mid-sixties and have been training with Daniel twice a week for 4 1/2 years. I shudder to think where I would be if I hadn't been working out with Daniel. It has definitely helped my core, made me stronger, more fit, and given me more confidence with my golf game. Daniel is a terrific guy, always pleasant, on time, eager to try new things if he sees you are getting bored with a certain routine, fun and very knowledgeable. I would definitely recommend Daniel if you are looking for a trainer. Daniel continues to exceed my expectations as my personal trainer through coaching, teaching, and maximizing results. Before I started working with Daniel, I had only 2 recent months of experience of working out. Daniel provided much needed guidance and instructions for basic movements and continues to demonstrate and teach exercises to this day. If he requests certain exercises to be performed and I am unsure what they are, Daniel will demonstrate the movement to show me exactly how to execute it. His explanations are detailed and clear. He always has safety in mind, so if I performed an exercise incorrectly, he will correct me and explain why or why not it may not be the best way to perform an exercise in a certain way. In addition to his teaching, his coaching is always motivating and positive. He holds me accountable for showing up to my workouts and encourages me throughout. He often points out my strengths and will reinforce positive progress. He provides constructive feedback where an exercise needs extra attention or work in a way that will benefit me in the long run. Daniel is always upbeat and shows a positive attitude. His friendly attitude allows you to get to know him as a person and not just as a personal trainer. He is extremely energetic about exercise, in particular the TRX training bars. This is a new tool he has begun to incorporate into our routines. Through his instruction, it is clear that he is very skilled in TRX training. Daniel focuses on maximizing results. I have personal training 2 times a week. Each workout begins with a warm up, planned out exercises and stretching at the end. Since a group of us workout with Daniel (at different times), we are able to compare the different workouts. It is clear that he tailors the workout to individual needs and capabilities. As he comes prepared with planned out exercises each time, he will often throw in things that aren't on the list if he thinks were capable of it. I have never completed the same workout with him as an instructor. He often mixes up his routines so that they are never predictable and I am constantly challenged and being pushed. His workouts focus on the total body, including strength, upper and lower body, legs, abs, and conditioning. Most of the workouts utilize free weights, dumbbells, and other portable tools that do not include machines. I have found this helpful, so that I can learn routines to practice while I'm not at the gym in which we workout at. The results that I have noticed include increased strength, weight loss, and increased muscle tone. Overall, I feel more knowledgeable about exercise, health, and fitness. I would highly recommend Daniel to anyone looking for a new fitness instructor. Whenever I meet someone in this field, I receive the "one-size-fits-all" treatment. Not with Daniel!! He listened to what I wanted to accomplish and puts a lot of effort into finding what is right for me. If something we try does not work, he moves on to something else. He knows how to educate me on the technique while also encouraging me on my efforts. And, he remembers that laughing is part of a good workout. Within 60 days I feel stronger and more agile and am so happy I locked him in for at least one year! I started working with Daniel in December 2015 and have had amazing results. I am in the best shape I have been in 15 years. He has been a fantastic trainer and great motivator. The workouts are different every time which keeps things from getting boring fast. He has a vast knowledge of fitness techniques and always making sure my form is correct. I would definitely recommend him to anyone looking for a personal trainer. Training with Daniel the past several months has been fantastic. I had been strength training on my own for 7+ years and his full body routines that teach you how to maximize your time in the gym is a must for anyone with a busy schedule. It has been a great supplement to my typical gym routine that had gotten stale. With his many years of experience it didn't take him long to identify the areas where I needed the most improvement, and start working to get better. I have had lower back problems in the past due to lifting, and being taught the proper form, and the improved flexibility I have gained training with Daniel has already paid dividends in regaining more mobility and strenght. I wouldn't hesitate to recommend him to any friend or family member regardless of their current fitness level. I've had great results since starting to work out with Daniel a couple months ago. He is knowledgeable about technique, a great motivator and varies each session to keep me on my toes. Daniel is attentive, making sure that I'm using the proper technique to avoid injury, and is always positive. I appreciate his customized workouts and friendly style, and highly recommend Daniel to anyone who is wondering whether a personal trainer is worth it. Training with Daniel over the last six months has been great. I have been sore in places I never knew existed! I've seen improvements in places like my golf game and I feel much more solid when I run (my ankles and hips don't get sore like they used to, from what I think is increased strength around my joints). He's also great when it comes to the pace and psychological aspects. He's good at reading how hard you want to go and where you are at during the workout. But he isn't afraid to push you. Would recommend to any friend or family member looking to get into better overall shape. I am a 39 year old father of 4, so finding time to focus on fitness has not been easy. After neglecting it for many years, though, I finally decided it was time to get back in shape. My main concern was how I was going to find the time to be able to set aside for a workout schedule. However, since beginning a couple of months ago, Daniel has worked with my schedule and he has been able to fit awesome workouts into the time that I have available. I have lost a few pounds, and generally feel more energized and healthy. Daniel is a great trainer, and he will help you reach your goals! I have an old spine fracture and several herniated discs in my neck, that result in much pain and limited movement at times. These injuries create a chicken and the egg situation; you need to move and workout to keep your body and core strong, however, working out can cause flare-ups and injuries which prohibit exercise and I am at square one again. I have worked with Daniel for 9 months now, and I can say that his training has definitely helped me manage my pain and significantly strengthen my core and body. During several flare ups, he has been persistent in motivating me to continue to exercise to keep my muscles strong and flexible. Many trainers are focused on weight and number of reps someone can do. Daniel focuses on modifying exercises to his client’s needs which allows me to master form during each exercise, helping me avoid further injury. He creates a workout that is challenging, focuses on my body's weaknesses, while challenging me in every workout. I have worked with many trainers over the years, some good, some mediocre, I would definitely put Daniel at the top of the list. He truly wants his clients to be fit and strong, but not at the sacrifice of injury. Daniel is a great trainer! He designs the workout sessions to meet me personal goals. His sessions are always educational, as he explains the purpose for each workout. I appreciate that he makes sure each session is different and we do not sit to the same routine. I would recommend Daniel to anyone as he is an excellent training. Whatever you are looking for in a trainer, Daniel is it! He’s a motivator, innovator, and a friend. He delivers fun, energetic adaptable workouts tailored your goals and needs every single session, and produces RESULTS! Its only been a few months, but I look forward to what he brings in his bag every time, because I know it’ll be something new and challenging. My wife and I have been training a couple times a week with Daniel for several months now, our first experience w/a trainer after years of going it alone (back when we had more time/energy and fewer kids!). What do you look for in a trainer coming to your home? We hoped Daniel would offer motivation, positivity, reliability, challenge, enthusiasm, flexibility, and creativity. He brings all of these, every single day, and he manages our individual strengths/weaknesses seamlessly to boot. We feel more fit and stronger, continue to improve, & are considering spending more time w/Daniel to achieve even greater results. It's hard to imagine a better trainer, or a better start to our days. If you're ready for a fitness kickstart and some help, Dan's The Man. I started working with Daniel several months ago at the end of my first trimester of pregnancy. The workouts have been very helpful throughout my pregnancy, providing me with additional muscle strength and stretching to minimize common pregnancy challenges like back pain. Daniel has done a great job at customizing each workout for the pregnancy while keeping the workouts engaging and varied. I really appreciate the convenience of having him come to my home and his creativity and knowledge in taking me through a great workout each time while keeping it interesting by incorporating different weights, tools, and exercises. I can't say enough good things about Daniel. I have been working with Daniel for about 6 months now, and the program he has designed to help me reach my fitness and overall health goals has been fantastic. When I started with Daniel, he had to work around long standing knee injuries and a shoulder injury, as well as low energy. Week after week, Daniel prepared new, interesting and challenging workouts. His knowledge of both proper exercise form and how to get my heart rate up without stressing my knees kept me focused on getting everything out of my work outs. As a professional, Daniel is always on time, positive, and dedicated to customizing the routine to take advantage of the best equipment available. I don't believe he has repeated a work out since we've started working together. Now 6 months later, with no shoulder problems, I completed my first 5K and achieved my first fitness goal. I now look forward to being active and don't shy away from the gym. I wouldn't hesitate to recommend him to anyone looking for a great trainer! I recently relocated to northern Virginia and I had a fantastic personal trainer in Seattle. I didn't think I'd ever find someone who could measure up to the amazingly effective trainer I left when I moved. But I have. I found and chose Daniel based on an online search which led me to THESE consistently "high praise" 5-star reviews posted by happy satisfied clients. Now I join them in strongly recommending Daniel. If you are hesitating about getting started with a consistent workout routine, try working out with Daniel. He comes to you, on time, always prepared, and the workouts are 100% custom-tailored to YOU. Daniel is truly a fitness expert, and also a really nice guy with a great sense of humor, which is very helpful in my case. He changes up every single session, keeping it fun and interesting and just a bit challenging but not frustrating. He gets it that results are important, and he pushes each successive workout up a notch, just enough so that I can see and feel the difference in my muscle tone and strength in just 2 short months. Aches and pains seem to have melted away. My advice: Get started with Daniel -- You're worth it! "I am a 48 year old woman who has been on some sort of diet plan since 1987 (that's when my son was born) I've tried all sorts of exercise programs; Curves, The Firm, 6 weeks, Numerous Beach Body programs, not to mention Atkins, Slim Fast, Nutrisystem, low fat, low carb, low calorie etc. You name it I've tried it and probably bought it! 3 weeks ago a friend recommends Daniel and start to train with him . Here it is 3 weeks later and I've lost 10 pounds! My clothes are looser! A personal training that actually delivers! A program without false promises! A program that doesn't make you workout 5-7 days a week but only 3X for 60 minutes! I've got to tell you, I was certainly skeptical because of past history, but WOW, I can't believe this. I tried on a skirt that I couldn't get past my hips last winter and I wore it today!!! I love this program; it's fast, fun and complete. Thank you Daniel for helping me on my dream."